KRISTA IS A MAGIC MAKEUP QUEEN! My photographer highly recommended her so I reached out and the entire process was so easy from there. She quickly responded and had answers for all my questions and we scheduled a trial right away. She communicates on Facebook messenger which was great for me as opposed to email. Always professional. Always fun. Easy to communicate with and talk to. She listens to your wants/ needs. I wish I had a mini Krista to do my makeup every morning. She was sooo great day of wedding. She did my mom, mother in law, sister and 2 bridesmaids and they all looked stunning and loved her work! My makeup stayed on through my sweat and tears the day of and she stayed through my first look to make sure I was good before the ceremony. CANNOT SPEAK MORE HIGHLY OF THIS WOMAN!! LOVE HER. Amazing job, loved working with Krista! Krista did an amazing job of fitting exactly my needs! She had an excellent idea of what I wanted, and worked to make sure I was happy through the entire experience!! AMAZING! I cannot say enough good things about this woman! KRISTA IS THE BEST! I was really anxious about getting my makeup done - I have never gotten professional makeup done before and I don’t wear much make up day to day. I was really unsure of what would look good on me and the thought of using an eyelash curler made me want to cry. Krista totally calmed my nerves and made the entire process a positive experience. She was so much fun to get ready with and all of my girls loved her! She knew exactly what worked best for each person and everyone looked flawless. I have never felt more beautiful! If you are still looking for a makeup artist you NEED to book Krista she is incredible. Krista is literally the most amazing person on this planet. She did my makeup as a bridesmaid for my friend's wedding and I knew I had to book her for my own. She is a makeup queen!! 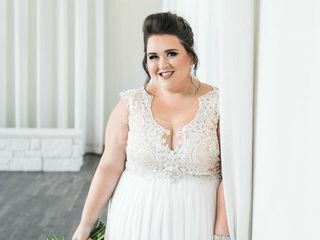 She did a trial for my bridal portraits and I have never felt more beautiful in my life, it made me so excited for the big day! On the wedding day, she had to bring a second artist, who was as equally amazing! They did my makeup, 7 bridesmaids and my mom! & everybody was in love with her and their makeup! She is so much fun and such an amazing person to work with! She keeps the day running smoothly, and her personality keeps everything so light and fun throughout the day! I would highly recommend her for anyone looking to hire a MUA!! BEST EVER!! BOOK NOW!! Krista Ann did my hair and makeup for my wedding and oh my god she was amazing. Let me preface with with the fact that I had a MASSIVE zit on my nose the day of my wedding...i know everyones worst nightmare...anyway I trusted her but knew it would probably still show. She made that disappear like completely, i was actually floored even-though i shouldn't have been since I knew she was amazing! She also left me with extra coverup so that i could keep looking flawless all night. I do have to mention I am not someone that wears or knows much about makeup and she was able to swoop in and make me look like a queen but in a natural way. She also did my bridesmaids and moms makeup and hot damn they looked amazing as well. I could not have been more happy and relieved know that I had someone that was going to take care of me and make me look gorgeous but not gaudy the day of my wedding. I loved her and look forward to working with her in the future! Simply put - Krista is absolutely amazing!!!! 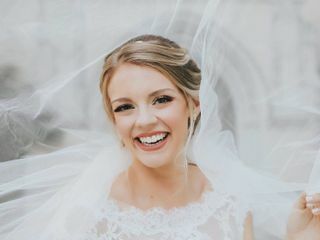 She was so much fun to work without throughout the entire wedding planning process, she listened to what I wanted but also consulted on what she thought would be best for my skin type and the look I was going for (which I appreciated so much because I am not a makeup guru) and she made me feel absolutely beautiful on my wedding day! Not only did she arrive at the venue early (major brownie points in my book) but she kept the day running smoothly, had everyone laughing and truly went above and beyond to make my day that much better!! Every one of my bridesmaids came up to me and said how much they loved her too!!! Best decision I made was hiring Krista!!!! I fell in love with Krista on Instagram through her posts and videos. Being a very particular makeup girl myself with a particularly dramatic and glam look in mind, I had my sights set on her right away! 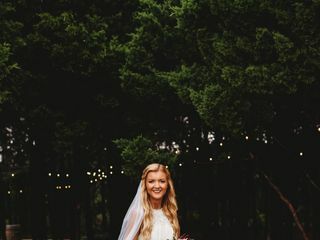 She not only became my soul sister instantly, but Krista went above and beyond to make my dream wedding look a reality! She was spunky, fun, professional, and dang good at her trade. She listened, executed flawlessly and followed up regularly to make sure we achieved perfection for trial, bridals AND wedding day. I couldn’t be more grateful for her talents and friendship and having someone I can’t wait to use again for future makeup needs! Krista was so easy to work with and she will listen to you and will give you what you want. She is very talented! Krista came to my hotel room and did make up for my 4 bridesmaids as well as make up for me. Krista is excellent with skin tone matching. Krista helped to make my day stress free and I would highly recommend her services! I have known Krista for a very long time! She is one of a kind in the most awesome way! Her personality is contagious and her work is well amazing! I believe that Krista has a natural gift for what she does and is always willing to do anything and everything to ensure her clients happiness! She has definitely gained a lifetime customer!!! Krista is AMAZING!! She is friendly, fun, and super easy to work with and book. I booked her fairly last minute, and she was able to squeeze in a last minute trial, and even recommended the hair artist that I ended up booking as well. She worked super fast and had me and my 6 bridesmaids done in about 6 hours. My bridesmaids all looked like supermodels afterwards, and I absolutely loved my makeup. It covered all of my acne and acne scars and stayed in place for the whole wedding. She even stayed until after my first look and portraits to do touch ups of myself and all my bridesmaids. I cannot recommend her highly enough! If you want perfect makeup that won’t budge all day, book Krista! This girl is AMAZING!!!! TWO of my friends (not connected at all) recommended her. I was so happy with my trial run and even HAPPIER with my make up on my wedding day. Not only is this girl good at what she does, but she is affordable and FUN! She is always smiling, upbeat and flexible. Thank you Krista for making he beautiful on my special day! Five stars for Krista does not do her justice! It would be a huge mistake if you do not book Krista for your wedding day. She was the very first vendor that I had booked. I had seen some of her work, so I decided to follow her on social media. Time after time she had created beautiful looks and you could really see the happiness in her brides. Once I booked Krista, I had my engagement photos and that is where we first met. She is an angel! I felt so comfortable with her and she really brought her A game!! My makeup was beautiful and I still receive compliments of how amazing my makeup looked in our engagement photos. I was able to be very honest with her and tell her what I would like and she checked throughout the whole process to make sure I liked my makeup. She was very flexible with her time and really tried to make every part of our wedding special. On the day of our wedding she did makeup for 10 girls, all by herself!!! Everyone of us girls looked amazing!! She took her time with everyone and really made them feel special. All of my out-of-state friends and family wish she lived near them. Another thing I really appreciated was when I was feeling stressed she was there to calm my nerves. She has the biggest heart and I am so thankful she was apart of my special day! I truly can not speak more highly of this lovely lady!! Krista will always be my go to girl for makeup!! Krista is the best makeup artist out there!!!! She did my engagement, bridal, and wedding day makeup. Through all the sweat and tears nothing budged, she even sent me to my shoots with touch up bags. Plus she stuck around a little while after pictures on the wedding day. Y'ALL! Krista is seriously the most amazing person you will ever meet. From the moment I looked at her page I knew I had to have her do my make up for my wedding day. Instantly she will make you feel like you have known each other for years! She always has her client's best interest at heart and will make you look and feel so beautiful. I will always got to Krista for my make up needs! Look no further, gals! Krista is incredible!! She did my engagements and wedding day and I can honestly say I couldn’t be more proud. She ALWAYS makes you feel like her top priority and you’ll feel like you’ve known her for years (which is awesome). She’s professional, sweet and witty all in one. If you’re looking for the best, this is who you want. You WON’T regret it!!!! It seriously does not get any better than Krista! SHE IS THE BEST! I used her for my engagements, bridals and wedding day and I will never go to anyone else! Not only is she incredibly talented, but she is also one of the sweetest people I’ve ever met! 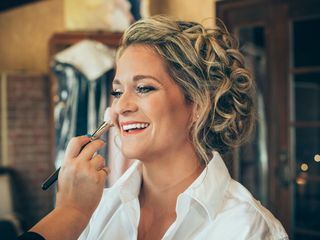 She was such a joy to have around on my wedding day and she made sure everybody was perfectly happy with their make up! She goes above and beyond and even stayed until I was done with my first look to make sure she was there if I needed any touch ups! Thank you so much Krista! I just LOVE Krista!! She is the sweetest person you'll ever meet! I met her at The Springs open house and didn't look any further! During the trial I explained my concerns and she did her thing!! She did several of my bridesmaids and everyone looked beautiful! After a full night of dancing and sweating my makeup STILL looked good the next day! Oh my gosh! I absolutely LOVE her! Krista is so easy to talk to, it’s like you have known each other for a lifetime! She does amazing work, and makes everyone feel beautiful! I would recommend her to anyone, for any occasion! 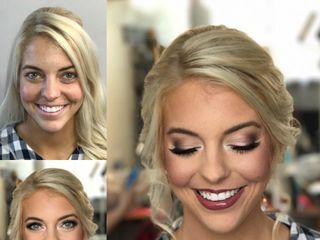 Krista did an amazing job on my makeup for my engagement pictures and for my wedding, along with my entire wedding party. I have never felt so beautiful and she helped make my day even more perfect! Krista was always extremely responsive and professional. I definitely have a makeup artist for life! 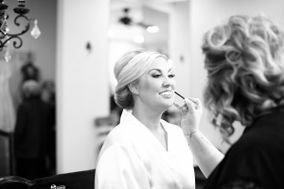 I first met Krista at a Boudoir photo shoot for my sister and fell in love with her! She is absolutely brilliant and I have used her multiple times for Boudoir, Engagement Shoot, Wedding, etc. She makes you 100% comfortable and will go above and beyond to make you happy!! You MUST book ASAP her because she fills up fast. I literally picked my wedding date around her schedule. LOVE LOVE LOVE her!!!! Krista is the absolute BEST!!! I would recommend her to anyone and everyone looking for a top notch makeup artist! 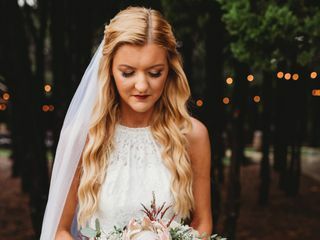 She made my bridesmaids and myself feel and look beautiful and was beyond flexible and responsive to any wedding day timeline changes that were made! She is THE ONE ladies and gents! I met Krista at the Denton Bridal Show. We spoke briefly and instantly I knew she was it. Krista made us look and feel amazing on this extremely important day. Her talent goes beyond being a makeup artist... She is patient, accommodating, professional and yet still fun. Krista asks all the questions to make sure that you get exactly what you want on your wedding day... and we got it! Thank you so much Krista! I first met Krista at a friends wedding outside of Dallas, TX. I'm generally pretty nervous to have other people do my makeup because I have very SEVERE eczema all over, but particular tricky on my face. Krista immediately calmed my nerves with her openness about how she's dealt with eczema in the past and the way she talked me through exactly what she was going to do. After she was finished, I was utterly shocked at how flawless my skin looked. Y'all, my skin never looked this good without the help of medication. My friends' jaws hit the floor and they couldn't stop talking about how good it looked. The makeup artist was the last thing I needed to complete my team for my own wedding in February. I couldn't turn to Krista fast enough to ask "Do you travel?" and "Are you available Feb 3?" She was and I instantly had that feeling of peace in what was honestly one of my biggest worries for my big day. 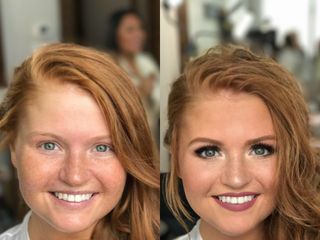 For my own wedding, Krista again worked miracles with my skin and I couldn't believe the amount of compliments I got on not only mine but all of the bridesmaids whose makeup she also did. Krista is absolutely amazing and seriously the most genuine person I've chatted with. I would absolutely trust her with my makeup for ANY special occasion!!! !